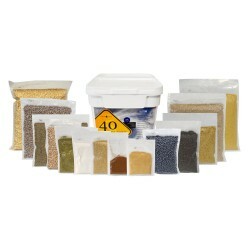 Be prepared for any emergency with our Organic Food Storage vegetarian preparedness bucket. Each 40 Day Survive2Thrive Kit includes enough USDA Certified Organic food to last one person for 40 days. 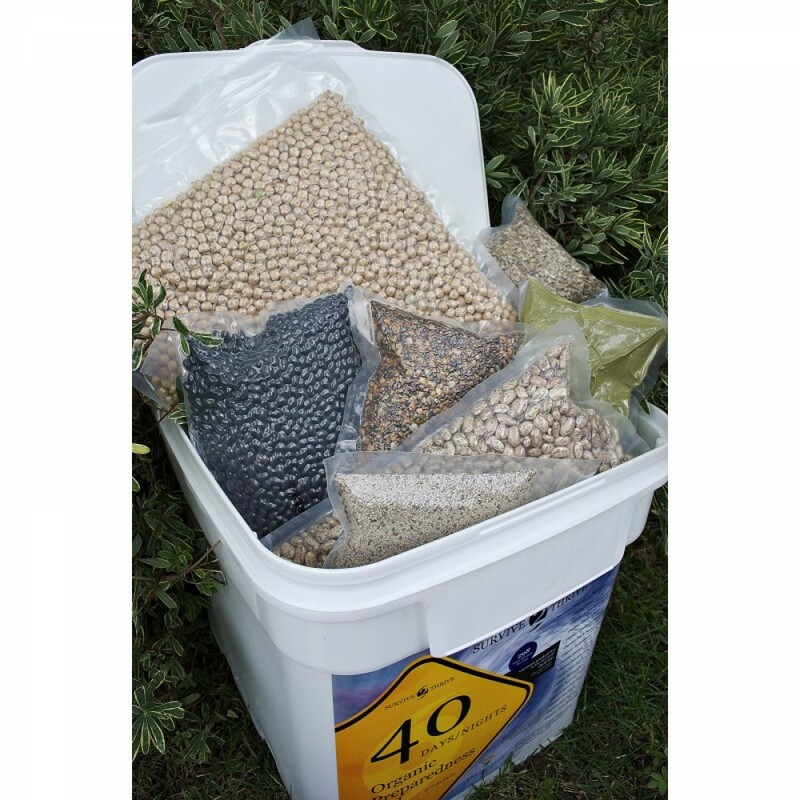 It is a nutrient-dense and affordable food storage bucket which is 100% Organic and Vegetarian. This Emergency Organic Food Storage Bucket is designed to provide for an adult for 40 days and includes tasty recipes to make using this organic food storage bucket easy. You will want to have clean water available for cooking. The grains and beans can be either cooked or soaked and sprouted. This bucket contains rolled oats which can be poured into a bowl with boiling water and soaked for breakfast without requiring cooking. You can create lunches or suppers by combining beans, rice, millet, or quinoa, Miso and a seasoning mix which all come packed into this small bucket. The bucket’s dense nutritional foods and its unrefined quality provide the best value. All the items in the bucket are organically certified. Daniel Fast food kit - Perfect for the Daniel Fast - This kit offers the exact amount of food for 2 people for 21 days and all the food fits the Biblical criteria. Enerfood has high vitamin, minerals and antioxidant content and should be used to replace one meal a day to get all the micronutrients your body needs. Oats are highly nutritious and are rich in fiber. The special form of fiber in oats is itself rich in beta-glucans, a kind of fiber with important cholesterol and blood sugar balancing as well as immune enhancing benefits. Oats are also rich in protein, vitamins and minerals. They are versatile in that you can cook them or just soak them for 20-30 minutes before eating them. Soaking oats with raisins or other dried fruit creates a very tasty breakfast. Buckwheat is wheat free and gluten free and is a great substitute for other grains. Buckwheat may also help in maintaining healthy blood sugar levels and supporting the cardiovascular system. Buckwheat is a considered a complete protein containing all eight essential amino acids. Buckwheat is also high in fiber, minerals and antioxidants. Buckwheat also is a great cleanser and can help alkalize the body. Buckwheat is high in iron and calcium, bioflavonoids, flavonols and co-enzyme Q10. It contains all of the B vitamins, magnesium, manganese, and selenium, as well as many other nutrients. Sprout blend contains sprouts of the following seeds that are subsequently dried at a low temperature. French and red lentils; whole peas, mung beans, aduki beans, alfalfa and radish. As mentioned above under sprouted sunflower seeds, all sprouted seeds contain a much higher nutritional profile than their un-sprouted counterparts. This pancake and baking mix makes delicious, gluten free and casein free pancakes, waffles, crêpes, muffins and more. This mix blends well with the organic powdered milk in the pail. If you follow a gluten free and/or casein free diet, you can blend this mix with dairy free rice, or almond milk. Ingredients: Brown rice flour, white rice flour, corn flour, tapioca flour, baking soda, (aluminum free) baking powder, xanthan gum, and sea salt. Enerfood, our award winning greens product Enerfood was a must for the pail, since it 100% Organic and contains powerful nutrition for better health, energy and immune system support. It is not just us that think so. Chia itself is considered a superfood. It has an optimal balance of Omega 3 and 6 fatty acids as well as being a superb source of vegetable based protein. Chia is hydrophilic in nature. It absorbs much more water than most other foods, leaving you feeling full and allowing your body to absorb nutrition more slowly. Eat dry as a snack and drink water. The chia will absorb the water and help keep you hydrated. Here Is an Example Nutritional Breakdown. Organic Winter Cherry Root - An ayurvedic herb to strengthen and rebuild the body. Ingredients: Brown rice flour, white rice flour, corn flour, tapioca flour, baking soda, (aluminum free) baking powder, xanthan gum, and sea salt.